Back in June, we reported about an upcoming Samsung 'Galaxy' PMP (YP-MB2) - a device rather similar to the Galaxy S phone - without the phone capability. We even found a video of the device. Today Samsung launched their Galaxy Player 50, which is probably the same player - but it does not have an OLED - it has an LCD instead. It's possible that Samsung wanted to use a Super-AMOLED indeed, but had to go for LCD because, as we posted a couple of days ago, Samsung can't keep up with AMOLED production demand as it is. It's also possible that this device isn't the YP-MB2, really, and Samsung is yet to announce it. Anyway - the Galaxy Player 50 is an Android 2.1 device with a 3.2" WQVGA multitouch LCD, 8/16GB of flash, microSD slot, 2mp camera and Wi-Fi. 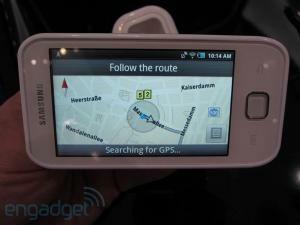 Samsung to release a Galaxy 'Lite' android phone with an AMOLED?